So, I'm all caught up on with the first part of Affinity for Andi's Readalong. Here's where we are. Margaret Prior, an unmarried woman, tries to distract herself from her problems by becoming a Lady Visitor to Millbank Prison. Her purpose is to talk to the women imprisoned there. The hope is the women will learn from her behaviour and become better citizens when they get out. Margaret finds Selina Dawes, a spiritualist jailed for assault and fraud. Margaret can't imagine a ladylike creature like Selina harming anyone. As Margaret becomes more interested in Selina she digs into her past for answers. 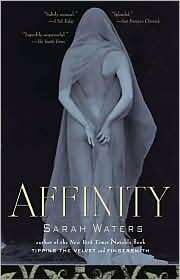 So far, Affinity is dark and mysterious. Waters makes the reader feel like they are within the prison walls. What a horrible place to be! The narrative alternates between Margaret in the present and Selina in the year before she was jailed. First Margaret, she's depressed. She might have had some kind of a break down. At first I thought it was because she was attached to her father and he died. But then I figured out that there was something going on between her and her new sister-in-law (yikes!) that went really badly. Her family seem concerned about her but not willing to talk about it. She appears to be emotionally fragile. Selina is hard to figure out. Is she a real medium or a convincing con artist? Then there's Mrs Brink, who invited Selina to live with her as a live-in spiritualist. This woman seems a few bricks short of a load. What is with the baby talk? And her dead mom? And that creepy maid Ruth skulking around? That whole scene is messed up. And I can't wait to get caught up where I'm supposed to be and keep reading!!! Awesome so far. I've been wanting to read this one for awhile.... great idea for a readalong. I love books about the Victorian spiritualist era; it's amazing how many famous, well respected people were caught up in the craze. I got the impression there was something going on between Margaret and Helen as well...which only adds a whole other layer to this story...how in the world it will all fit together will no doubt be interesting.